Some mornings manage to lighten my lengthy commute with a giggly pearl or two and just ten minutes of flicking through the free Metro newspaper on the first stage of this morning’s trip yielded another gem I couldn’t wait to share with you. Yes, it is a clock. Yes, that is cooked bacon in the little drawer. 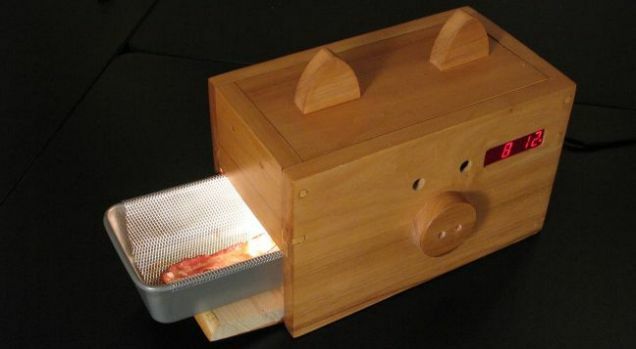 And yes, it is built in the shape of a wooden pig! This entry was posted in Commuting Gems and tagged Wake n' Bacon by Kym Hamer. Bookmark the permalink.